Catch up by going to my Short Story page. As promised, two parts of the story this week. Next week could possibly be the final and you will finally see the photo that inspired this short story. I had paced my cell, I had shaken the bars, I had even tried to pick the lock with a knife I had in my pocket. Nothing worked. I couldn’t cry out for help, for fear of Naolin getting captured quicker. I wasn’t shocked that Gabriel had turned on us. He was here for Lilith the whole time, he was trying to please her. Of course I had seen it from the moment I saw the two together. I just didn’t realize in time that it would lead to failure. I sat on the bed, amazed at how soft it was. Bouncing on it a few times, I considered just sleeping through the mess. Eventually someone would make their way down to the dungeon to find that Lucy had escaped. If I was lucky, someone would notice before it was too late, but I hadn’t been lucky so far. I leaned over and put my face in my hands. I couldn’t believe I had messed things up so bad. Who was I kidding, thinking that Naolin and I could be together? Of course the universe would be against it. Why would a demon have a happy ending? I shook my head and scolded myself for giving up so easy. I had to do something. I jumped up from where I sat on the bed and scoured the cell, which was more like a bedroom then an actual cell. I looked through books, journals, boxes, and drawers. I didn’t know what I was looking for, but there had to be something there to help us. I had to get out and save Naolin. I had to fight for our right to be together, to find love and to live that love out until it was spent or the world came to an end. The way things were going, the world would end within a week. “What are you looking for?” My heart stopped. I was afraid to turn around, in case my ears had deceived me. It sounded like Naolin, but maybe my mind was playing tricks on me. I stood from where I had crouched down digging through a box, and turned around slowly. She stood right there in front of me, with the door open. How had I missed the sound of her feet, or even the opening of the door. “Anything to get me out of this cell and stop Lucy from destroying mankind.” I said to her as a smile spread across my face. She ran into my arms and kissed me with so much force she came close to splitting my lip. “I know how to stop her.” She said when she pulled away from me. “How did you get the cell door unlocked?” I asked. “So you used me?” I asked both of them. I wasn’t mad, I just thought it was funny that I had been played a little bit. “We have to go.” Peter said as he disappeared around the corner again. Naolin grabbed my hand and we rushed after him. “I can’t” She wouldn’t look at me. She just kept moving forward, but her voice had faltered. I could hear the sadness in her voice. It was a sadness I had seen in myself, the day I realized my best friend would have to die. “Someone has to die?” I guessed. She only shook her head and continued to move me forward. Up ahead I could hear the keys in a cell door and the door sliding open. I almost felt relieved when I heard Michael’s voice, or what I assumed to be his voice. It was loud and powerful, a voice that bounced boomed into existence and left a permanent scar on your heart. Michael was the enforcer of rules, the warrior that fought for what was right. The question that lingered was, what side does he feel is right? “Now Lucy is wreaking havoc on earth, destroying anyone and anything that gets in her way.” Peter stood beside Naolin. 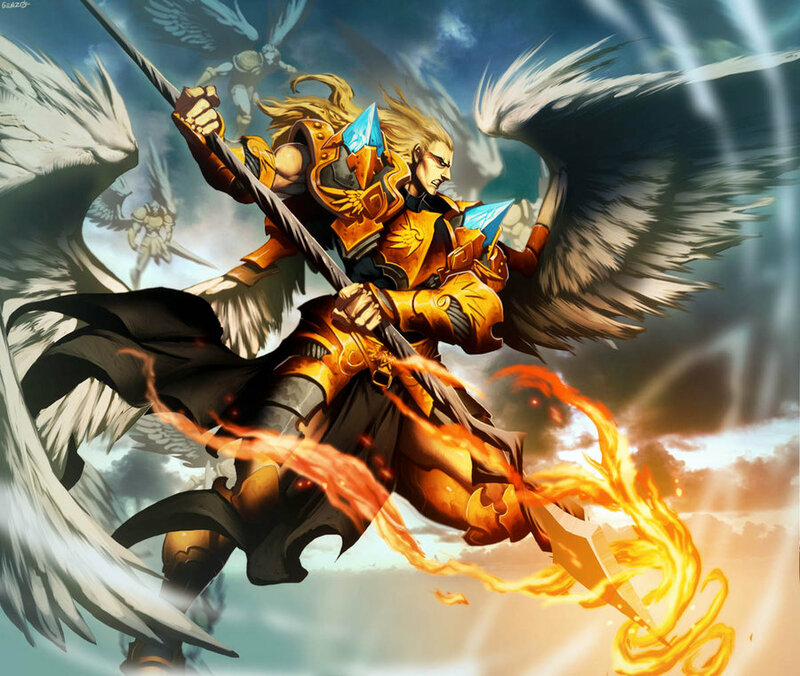 “We have to change things, or we will find ourselves right back in the same situation.” Naolin pleaded with the warrior angel. His eyes had never left me, but his eyes were returning to their normal blue color. “I am only here to help.” I said as I moved to stand beside Naolin. I couldn’t show fear to the angel, I had done nothing wrong. Naolin grabbed my hand, entwining her fingers with mine. “I know how to stop Lucy, you just have to trust me, and you have to have my back.” Naolin said. Her words were rushed and quiet, as if she didn’t want me to hear. “It’s the only way.” Michael said, his hard face going soft with a frown. I had missed something that everyone else knew. It left a sick feeling in the pit of my stomach. I would have done something about it, but I didn’t know what was going on. I didn’t know what I had missed. It was some kind of angel knowledge and they were not letting me in. “We have no more time to waste, we have to move if this is going to work.” Peter said. I should have asked then, but I was too afraid to know the answer. This should come to an end in the next part, or maybe two parts, but soon. I hope you have enjoyed this far.